2 night minimum weekends, Fri/Sat or Sat/Sun. Weekends are $130/night. Tree House with full private bath. Oak & Italian tile floors. Queen size cherry pencil post bed. Private gazebo with Swing beneath. 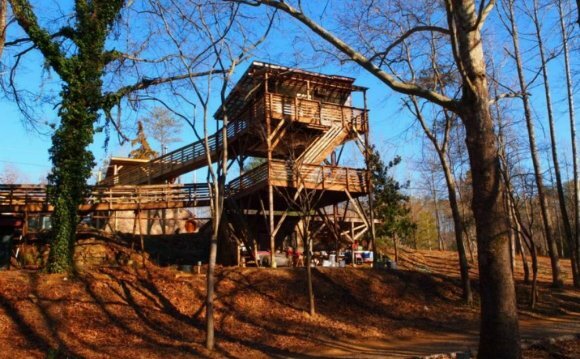 300 ft catwalks connecting to lunar Sauna and a 2nd Stone and Cedar Gazebo. Secluded setting with numerous ponds, canoe, a floating dock, nature trails, picnic area with a fire pit, shelter & grill (hickory wood provided), stone & cedar gazebo, wood fired lunar sauna, cool dip pool, frisbee golf course, makings of a organic vegetable farm. Lots of birds, bunnies & squirrels:) Map of the grounds provided in each room. 32" HDTV with a BluRay player & free Netflix. NO cable or satellite channels in the rooms. GRACE AUDIO 18, 000 station internet radio. Eco-friendly dimmable LED lighting. Wireless high-speed Internet. BREVILLE grind & brew coffee maker with locally roasted, organic, fair trade, coffee beans. Electric hot water kettle for tea, french press for steeping teas, all conveniently available in the room. Drinkable water from tap. Massage room, sky lounge, game room and meditation room in barn accessible to all guests. Complimentary land line phone available for unlimited local & long distance calling in the communal kitchen. For group gatherings and multiple guests movie theater is accessible with advance notice and prior scheduling with the host. Guest rooms have netflix/TV provided in the rooms for individual viewing. Lounge overlooking the green house in Castle accessible to all guests. Study room located at the entrance of the castle before you get to suite D & P. Communal kitchen. With advance notice private yoga classes are available at our local studio. For availability/appointment & fees contact Kumud VanDerveer (Instructor/host) at (EMAIL HIDDEN) or (PHONE NUMBER HIDDEN). With advance notice private massage can be scheduled both for couples and singles. For appointments let us know and we will connect you with the Massage therapist. Suite D & P, accommodating 4 additional guests available at 'The Castle'. Suit(URL HIDDEN)available at the Zen Barn. *100% LED lighting in all Guest rooms & kitchen. *All natural flooring(Maple, Marble, Bamboo & ceramic) & pine ceilings. Poplar wood from our property is used in our guest closets. *All guest rooms & kitchen have 7" insulated walls. All guest rooms in the barn have Split AC/Heating with invertor technology. *All our energy efficient windows & doors use thermal shades or curtains. *We provide Organic, fair-trade, and locally roasted coffee. We have gold toned coffee filters in our coffee makers avoiding wastage of paper coffee filters. *We provide organic teas & fair trade sugar for our guests. *Our Mulberry farm follows all organic practices. *We use an Energy Star ‘HE’ Washing Machine and Dryer. We prefer to use clotheslines on sunny day & when we can work around our visiting guests. *All our laundry is washed with Ecos plus(HE), made in USA. *The room has Energy Star LED TV & BluRay player. *All hand soap, shower gel, shampoo & conditioner provided are made of bio-degradable ingredients, paraben free, SLS free, no animal ingredients or testing & no artificial fragrances. *We use single stream recycling service & compost our coffee grinds for garden. *We provide eco dishwashing liquid, which contains no petrol chemicals and is 100% biodegradable. We use Green Works toilet cleaner & Seventh Generation Dishwasher Gel. *We provide 100% recycled paper napkins & 40% recycled toilet tissue. Due to allergy reasons we do not allow pets in any of our rooms or common/shared areas. No exceptions please. Hosts & other long term residents live on premises. Units are not independent cabins. Our retreat is not appropriate for young children. Many of our guests are looking for a quiet getaway. Well-behaved children over the age of 14 are welcome, however we do not provide special beds or cots in the rooms for extra guests. Separate rooms have to be reserved for all additional guests. The farm is located across the road from the barn. Billy Caldwell is the farm manager & is happy to give tours when he is available. Produce can be bought on site when & if available. Contact host for getting in touch with Billy Caldwell & making appointments for farm tours. How to do Yoga handstand Virginia?